That kid who played Paul McCartney in the Lennon bio-pic, Nowhere Boy plays a Billy the Kid type role as Whitey Winn, that guy who played dumber alongside Jim Carrey in Dumb and Dumber gives us the most memorable and complex western bad guy in recent years with his finely honed performance as Frank Griffin, that woman from Downtown Abbey gives us a much more grounded character than the aristocratic lady which shot her to fame, and that handsome guy who is not George Clooney from Money Monster is the good bad guy, Roy Good. Curious casting maybe, (in fact with the exception of Jeff Daniels the lead actors are all Brits) but Godless from streaming service, Netflix is the finest small screen western since Lonesome Dove. I kid you not, it is that good - expect it to be rewarded highly when award season comes around. Written and directed by Scott Frank the production shows a fondness for Leone type tracking shots, Ford'ian cinematography, Tarantino'esque violence and most importantly storytelling of the finest kind. The script was originally intended as a movie but Netflix were on a spending spree and asked Frank to flush out the story for a limited TV mini-series and we should be thankful for this - split over seven episodes, all of them longer than a hour and some of them a mini movie in themselves, gives a larger canvas to work with. And not a second of this time is wasted with each and every character flushed out. Of course we have all the stock western characters - the good time girls, the crusading newspaperman, the noble sheriff. They're all present and correct but the world in which they operate seems very real indeed. 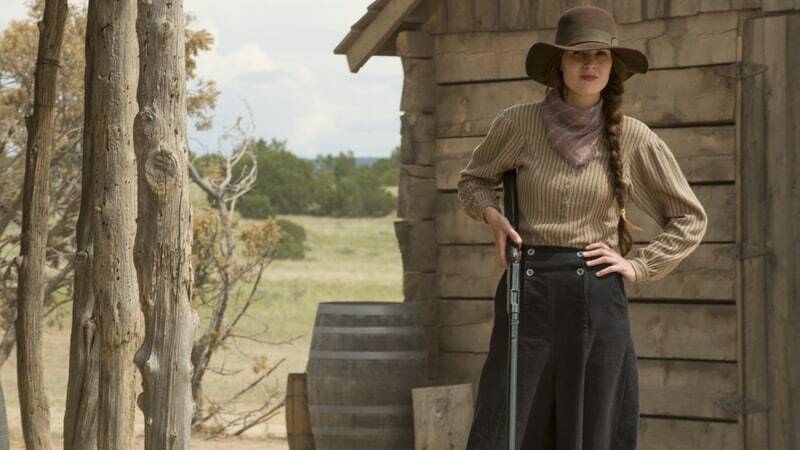 When I first saw the trailer I feared it was another of those all too common shows with correctness as the driving force - the trailer seemed to suggest it was a western about a town populated solely by women and their fight to survive in the harsh environment, and whilst the town of La Belle is important to the story, Godless is really driven by the promise of an inevitable showdown between Frank Griffin (Jeff Daniels) and Roy Good (Jack O' Connell). Of course the all female town is an interesting twist to the standard western story and the origin of this town is explained logically within the story - La Belle is a mining town, a small town in which each of the residents has a stake in the mine and a disaster one day takes out virtually the entire male population. This makes the town interesting to a swindling mining corporation and this is just one of the story threads running through the rich tapestry that is Godless. The relationships between Frank Griffin and Roy Good is presented in flashbacks alongside the main thrust of the story, and it's all the better for it. After the first episode we view Frank Griffin as a man without a soul, pure evil itself but a couple of episodes in and we see he is much more than a pantomime villain,. In fact in his own mind he's not evil at all, and although he does much during the run of the show that would put the devil to shame, he does a lot of good also. It's a wonderful performance by Jeff Daniels. Likewise Roy Good (Jack O'Connell) who has a father/son, Love/hate relationship with Griffin gives a pitch perfect performance. 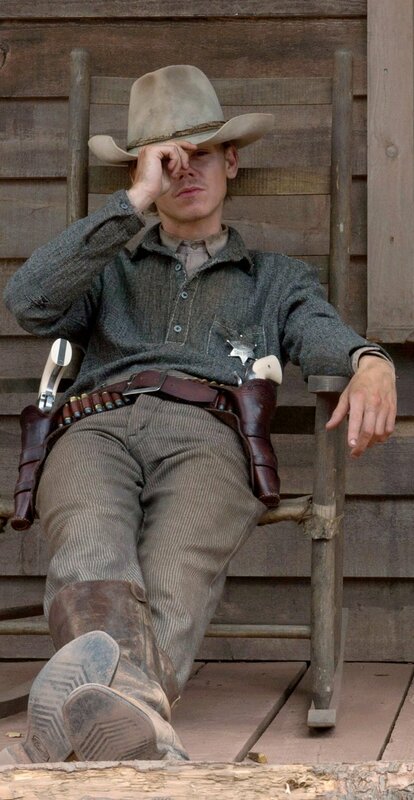 'Ain't nothing scarier than a man with a gun. Ain't nothing more helpless than a man without one.' Frank Griffin. Other notable characters are Whitey Winn, the fast shooting deputy whose lanky frame and amiable manner brings to mind a young James Stewart, the lesbian Mary Agnus played by the always wonderful, Merritt Weaver who steals every scene she's in and a passel of well rounded townsfolk, gunmen and plain old ordinary old west citizens. All in all this is an excellent show and all 7 episodes are available to stream over on Netflix right now. 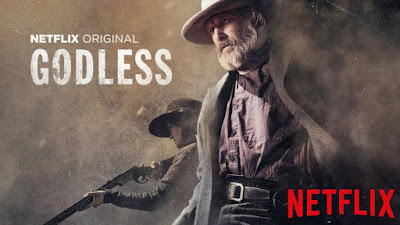 I'm a western lover and I rate this show as better than the recent Hell on Wheels, hell to my mind it even bests the wonderful Deadwood. Godless then is a true classic of the genre with a soundtrack that equals those old Morricone scores. And that final operatic shoot out - well without spoilers all I can say is that it is an absolute masterclass in action film - virtually the entire town are involved and the women folk of La Belle prove that they are every bit as deadly as the hardened men who would do them harm. 'I seen my death. This ain't it.' Frank Griffin. When I first started The Tainted Archive, way back in 2009 it was to write about my love of the western genre and also to promote my first western novel, The Tarnished Star. Over the years the blog has changed and become something that encompasses all of pop culture. My writing's branched out also - as well as the westerns, which I still write, I've been publishing non-fiction historical work through Pen and Sword Books and next year will see the publication of my first crime fiction hardcover. However the Western is still foremost on my mind, it remains the genre which I love the best - earlier this year in fact saw the publication of my eighth novel for the Black Horse Western imprint with Massacre at Red Rock. And I intend to get to work on a new western novel early in 2018. There have been scores of low budget western movies this past year, most of them straight to DVD but some of them enjoying limited theatrical releases. OK, many of them have been forgettable but there have been some nuggets of pure gold in amongst the pyrite. On particular movie I would urge the reader to view is Tombstone Rashomon directed by Brit Alex Cox. 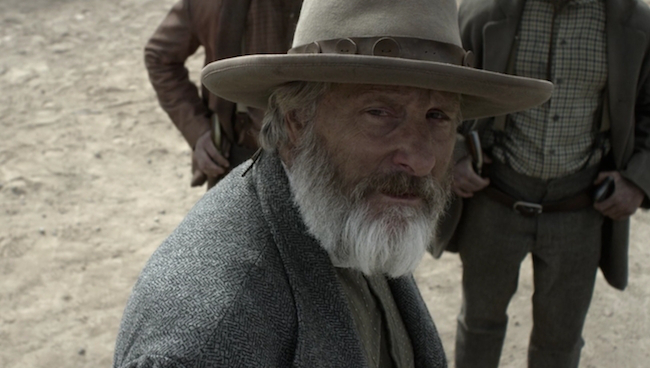 The movie was crowdfunded and shows not one but five differing versions of the infamous gunfight at the OK Corral, each from the perspective of the different lead players. It's an interesting movie that could have benefited from a larger budget, but even in its lower than low budget state it remains a fine viewing experience. Another low budget and more traditional western I would point fans towards is The Ballad of Lefty Brown, a straight forward revenge western that shows a real love for the genre. With a much larger budget and a big name cast, Hostiles (which I've not seen yet since it doesn't get a UK release until Jan 2018) looks hugely promising - already it's gathered good reviews and the trailer promises an intelligent western movie. 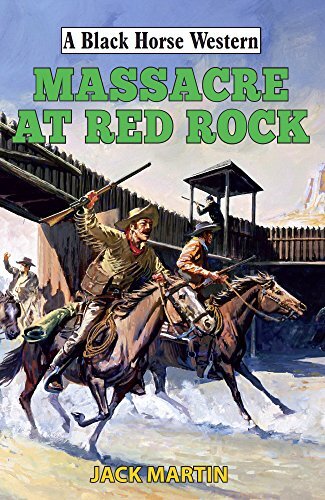 The western's continued to put in a strong showing in the literary world - Robert Hale's Black Horse Western imprint, now owned by Crowood Press, continues to put out hardcover westerns on a monthly basis, most of these books also become available digitally and as large print paperbacks. And speaking of eBooks the excellent Piccadilly Publishing continue to release classic and original westerns. And of course over in the US there are several major publishers that continue to put out western novels. I must mention Craig Johnson's modern day oater, the Longmire series which, enjoys strong sales and is helping to bring mystery readers towards out beloved genre. In fact given all the classic westerns coming out in eBook, not to mention the stuff coming out from small and self publishers then there has never been an easier time to get your hands on a western fix. The western is even represented in new media, with several podcasts that western fans will find enoyable. So take a seat around the virtual campfire and check out Voices of the West . Another show which I enjoy is Westerns with Dad , in which father and son team, John and Scott Bernhard watch and talk about classic western movies. A recent episode that I very much enjoyed compared the John Wayne True Grit with the Cohen's remake. Another great podcast is Hellbent for Letterbox, which again focuses on western movies and is hosted by Paxton Holly and Michael May. There are also scores of podcasts that present Old Time Radio westerns but one I would urge you all to try is TimesPastWesterns - this particular podcasts cherry picks the best of old time radio for our western pleasures. So this long dead genre seems to be very much alive and kicking, and no doubt the next classic western is just around the corner. So saddle up, there's plenty out there to enjoy. 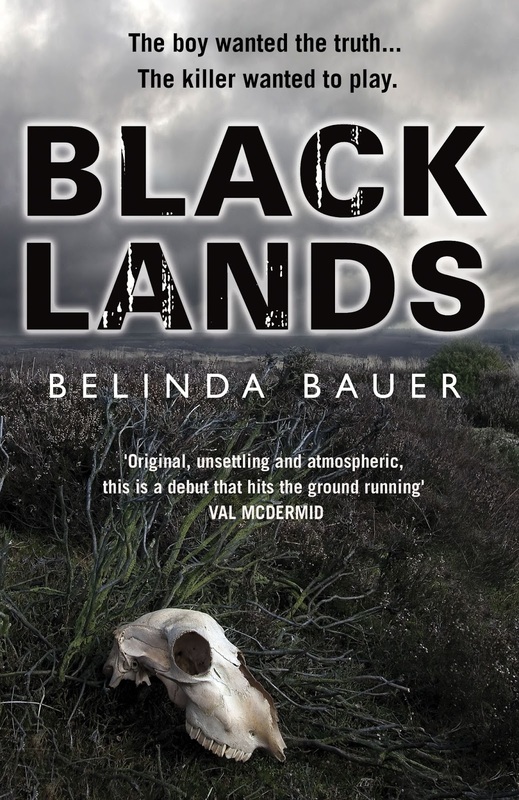 This book is a sort of sequel to Black Lands, which I raved about, but it was not in the same league. 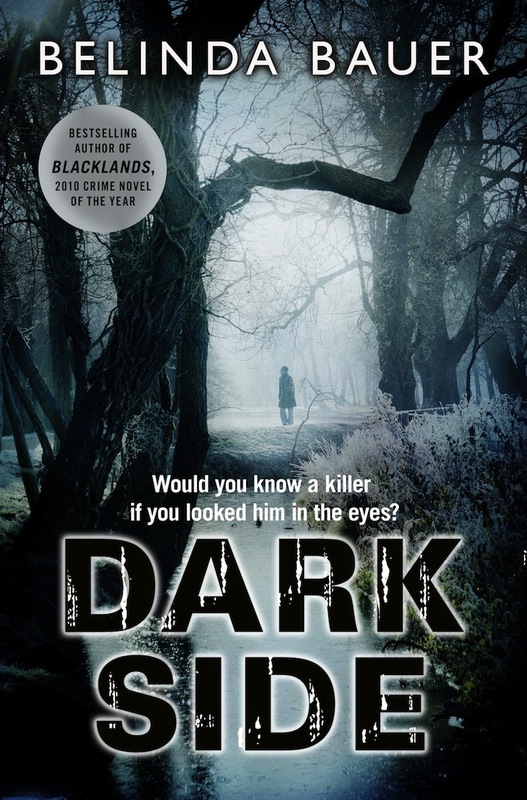 It's not a bad book, far from it but it seemed disjointed to me and I'd guessed who the killer was by the half way point - it starts out very well but it's nowhere near as dark as Black Lands and on times trends in cozy crime territory. 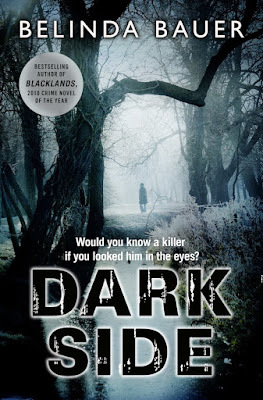 And that to me was a problem when I was reading - I like cozy crime but this story seemed to want to be dark psychological thriller and cozy crime at the same time and I just didn't find it as compelling as the other books I've read by the author. There is a another book that follows on from this one, Finders Keepers and I'm starting that one immediately, but only because I know how good the author is having read two of her other titles. If Dark Side had been the first book I'd read by this author then I probably wouldn't contimue. The next book, containing several of the characters carried over from this one, should be interesting particularly knowing what I know about them from reading this one. 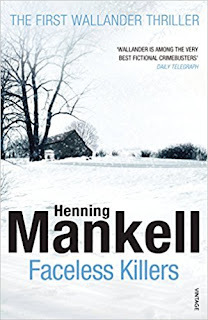 This is the first of the Wallander books - I knew of the character, but had never read any of the books though I had seen several episodes of the TV series (the BBC version) and I'd promised myself I would check out the books one day. And so this week I picked up the paperback from my towering TBR pile and vanished between the pages. It's a very dark book and Wallander is a brooding character. There's not much joy in this book - everyone's so miserable, and the main character seems to enjoy wallowing in misery. Mind you he doesn't have much to smile about - he lives alone, eats nothing but junk food, and loses sleep because he's always dreaming of a beautiful black woman. On top of all that he has to cope with the fact that his father is slipping into the clutches of dementia. 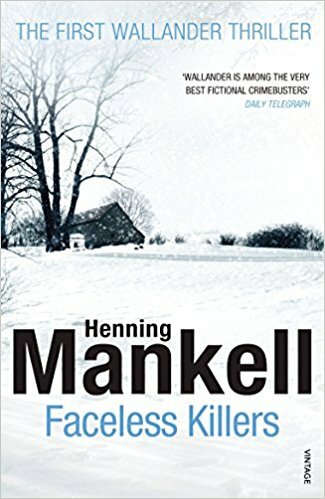 It takes awhile for the book to get going, but when it does the pace really picks up and for all his flaws Wallander is a compelling character. The plot sees the detective investigating a brutal double murder of an elderly couple and touches on hard hitting subjects such as racism and xenophobia. These latter points make the book as topical as a newspaper headline. Noric Noir is the current thing, and this book, this series rather is considered to be a blueprint for the genre. I'll certainly be checking out more in the series - in fact I plan to read them in order and have already downloaded the second in the series to my Kindle. I guess when I've read more of the books I'll know how typical or atypical this book is of the genre itself. All in all I enjoyed this book and am glad I dipped my toe into the Wallander series. After devouring Rubbernecker (see previous post), and finding it one of the most enjoyable thrillers I've read in ages, I immediately decided to seek out more work from the same author. 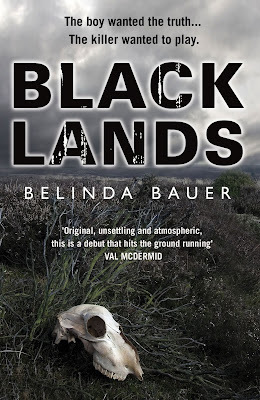 And so we have - Black Lands, which was actually author, Belinda Bauer's first novel and very successful it was too, actually winning the CWA Gold Dagger Award. No easy task, particularly for a debut novel. The book is largely told from the viewpoint of Stephen Lamb, a twelve year old boy who lives with his younger brother, his grandmother and his mother. He craves for affection from his grandmother but she has never gotten over the murder of her son, Billy who was murdered by child killer, Arnold Avery, his body never found. Stephen spends much of his time digging holes on Exmoor, feeling that if he can locate his uncle's body then his grandmother will finally be able to get over her grief, which Stephen believes will heal his family. It's quite hearbreaking to read the inner thoughts of this young who spends his childhood searching for the body of an uncle he never met and things take a dark turn when Stephen gets the idea of writing to Avery in prison, asking him for help in finding the body of his long dead uncle. In some ways the book reminded me of early Stephen King - the way the author pits the innocent young boy against pure evil is almost vintage King. Though where King's child heroes would be facing off against vampires or shape shifting aliens, Stephen Lamb's nemesis is all too real and far more down to earth - one of those monsters who really exist. There are other Kingsian touches too - the way Stephen's young life is blighted by a gang of bullies for one thing, but I'm not trying to suggest that the author is channelling King, but rather making the point that she creates child characters with the masterful sweep that King displayed in his early and greatest works. It's genuinely unsettling to read the correspondence between the young boy and the child killer, and the tension is ramped up as Avery plays a cat and mouse game with the innocent young boy. Soon we start to realise that Stephen Lamb may in fact become Avery's next victim. The climax of the book is incredible and as Avery stands there against the featureless Exmoor landscape, looking down at the young boy he is far more terrifying than any mere vampire or shape shifting alien could ever be.